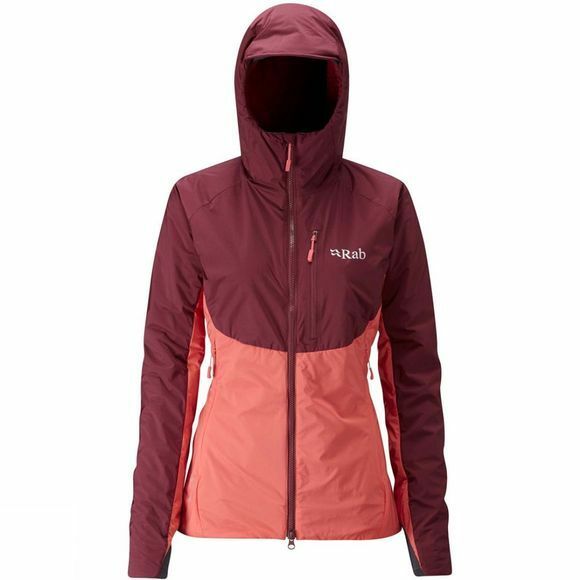 Rab have developed the Women's Alpha Direct Jacket to be a breathable outer or mid layer with Polartec Alpha Direct insulation technology to keep you warm and comfortable during demanding activities in cold conditions. Without a jacket lining, sweat can move through the Polartec Alpha insulation and away from your body via a quicker, more direct route, to give exceptional wicking efficiency. It also reduces the overall weight of the jacket while still keeping you warm. An ideal mid layer for fast-paced adventures, or when it isn't raining constantly, the jacket is a great option for an all-day outer piece, thanks to the wind protection provided by the Pertex Microlight outer fabric. The under helmet hood has a tricot lined collar and the top of the zip has a chin guard for extra comfort. The inner storm placket helps to keep warmth inside the jacket and weather on the outside. Several pockets are positioned perfectly for stashing kit that you'd prefer to keep close to hand. The slim fit is designed to accomodate just a base layer underneath.